The adults-only Aqua Pedra dos Bicos Hotel is a gem along Portugal's South coast. Set on the edge of the warm sea waters, this is a sun seeker haven, while Albufeira offers both fantastic beach life and night life too. 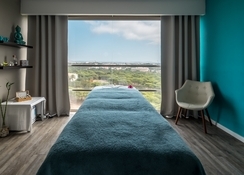 Aqua Pedra dos Bicos Hotel offers a plush and contemporary design and provides spacious and comfortable living areas, plus you can choose from an array of rooms with inspiring sea views and furnished to the highest standards of quality. The Aqua Pedra dos Bicos Hotel is scarcely a stone's throw from coast and the cliff-lined beaches. Try the featured Mediterranean cuisine at one of the many top restaurants for a true culinary experience and if you're big into sports activities pick up a tennis racket or golf club and trying hitting a few shots set amongst the unbeatable backdrop of Albufeira or pick up a bargain souvenir with great shopping experiences never too far away. 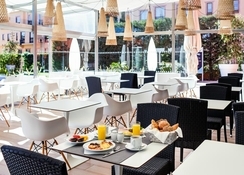 The Aqua Pedra dos Bicos Hotel affords those looking for a relaxing break just that. 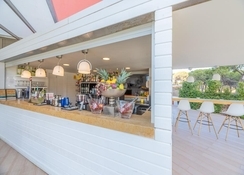 The nearest major airport is Faro International Airport, which is just 35 km away and with frequent taxis leaving the airport every few minutes you can be booked into your room in as little as 30 minutes and the beach is just a brisk walk away from the hotel. 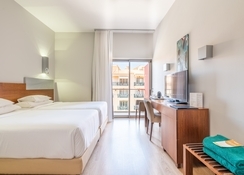 Aqua Pedra dos Bicos Hotel comprises 140 guestrooms and suites furnished to high standards of quality and practicality whether you're staying by yourself, as a couple or part of a larger family. Rooms are equipped with modern conveniences, including Wi-Fi, air-conditioning, television, tea and coffee making facilities and a personal safe amongst the amenities. Room types available include Classic Rooms, Double Rooms, Premium Rooms, Sea View Rooms and Suites, many of feature a private balcony. 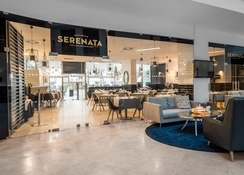 Aqua Pedra dos Bicos Hotl’s glorious Serenata Restaurant offers exceptional dining in stylish and modern surroundings, with the tempting menu presenting a wide choice of modern Mediterranean fusion cuisine. During the summer, guests have the opportunity to dine under the stars overlooking the stunning and they can enjoy the relaxed atmosphere in the Lounge Bar with a refreshing cocktail and more. Sticking to the hotel you will find all you need for a enjoyable night. You might want to start with a soothing massage, then grabbing a drink at the bar or simply picking one up lounging by the pool. There are child-friendly facilities too, including a playground and dedicated children's pool. There are a plentiful array of water sports opportunities, including snorkelling and scuba diving among others. Plenty of sporting facilities are within easy walking distance from the hotel which include cycling, golf and tennis. If you're looking to party the night away, a short walk to Av Sa Cameiro will offer up several popular night clubs. ADULT ONLY HOTEL (MINIMUM AGE ALLOWED IS 14 YEARS OLD). This property will not accommodate hen, stag or similar parties. 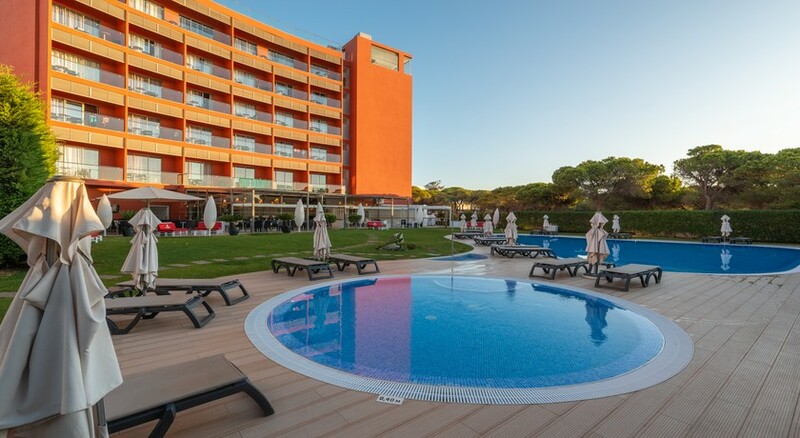 For group bookings, a refundable deposit of €100 per person in cash may be payable on arrival and is at the hotel's discretion; the Hotel considers a minimum of 5 rooms as a group booking. The Hotel may refuse any and all sets of bookings with 5 rooms or more. For bookings of 5 rooms or more, different policies and additional supplements may apply.